Can you imagine what it would be like to be going about your daily chores and have a group of strangers show up on your street, come to your house and tell you of someone you had never heard of before? These strangers are of a different color, they don’t look anything like you or your friends. They speak a different language. You wonder where they have come from and why they have come. These strangers say they have come to tell you the story of Jesus. Can you imagine? Would you be just a little frightened? Wouldn’t you have some doubt? I am sure you would ask who is this Jesus and why do I need to know about Him. Weeks before our mission team’s arrival in Tanzania, prayer had been lifted up that the Lord God of the entire universe would prepare the hearts of those He would have us meet and tell the story of Jesus; prayers that the Holy Spirit would prepare their hearts to hear and to receive the precious gift of salvation and prayers that we would have a spirit of love, joy and peace when we presented the story. It was our third day in the area called Salawe and we were walking back to the car to start our return trip back to our meeting place. A man on a bicycle was asked if he had heard of Jesus. He said that the previous day other members of his family had heard the story and repeated the story to him. We told it again and he said yes, that he would like to be baptized into the family of God. Then he asked if we would go talk to his grandmother, who was ill. She could not walk to us. We said of course and walked across the plowed field to meet his grandmother. She was sitting on the ground next to their house. We could see that cataracts were impairing her vision but not so much that she could not see my white skin and my white hair. 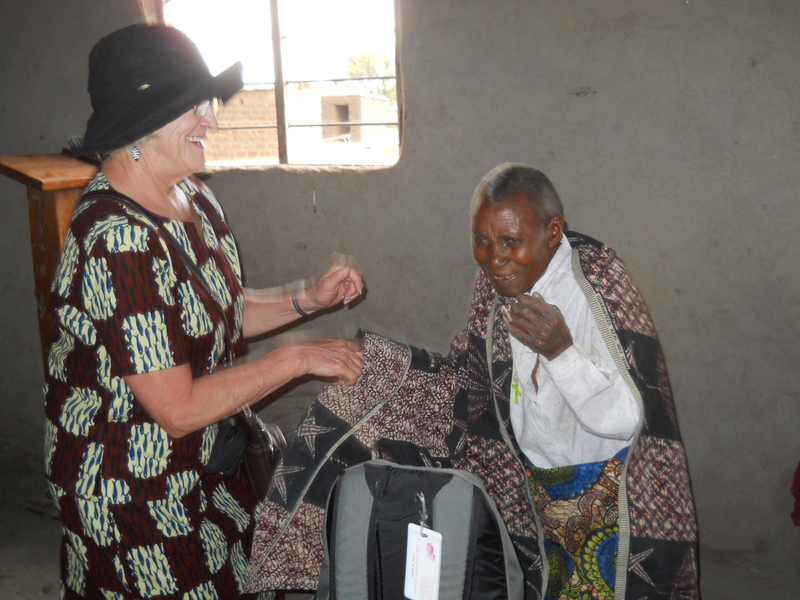 Cataracts are a common problem in Tanzania where medical resources are scarce. When someone is too old to work, they stay home and do whatever chores they can manage. She said she was sure she was older than me. So we compared ages, she was 98, I am 73. The average lifespan in Tanzania is around 47 so this is amazing. We told her the story of Jesus, how He loved her and had paid the price for her sins. She was excited to hear for herself and said yes to the Holy Spirit’s call on her heart. It took 98 years but she finally heard of His saving grace. What a privilege to share this story and witness her baptism. If we who know Him will just obey and go tell others, the Holy Spirit does the preparation and the follow up. Now an entire village has heard of Jesus, many answered His call that day and will tell the story to everyone they meet. They now have a hope and an assurance that they do not walk alone and that their future is secure. The scribe attending this baptism recorded her tribal name and her selected new Christian name of Hannah. The evangelist in this area will follow up and talk to her about worship services in the area. The services may start under a mango tree but eventually the people will build their own church, clearing the land and making the mud bricks. They are very proud of their churches. This lady may not live to see all this happen in her earthly life but her place in eternity is secured. (Note from Susie Allen/TN) Judy and I were American partners on this day along with the Tanzanian evangelist and scribe. My pace quickened as it was time to walk back to the car. I found myself quite a bit ahead of the group. 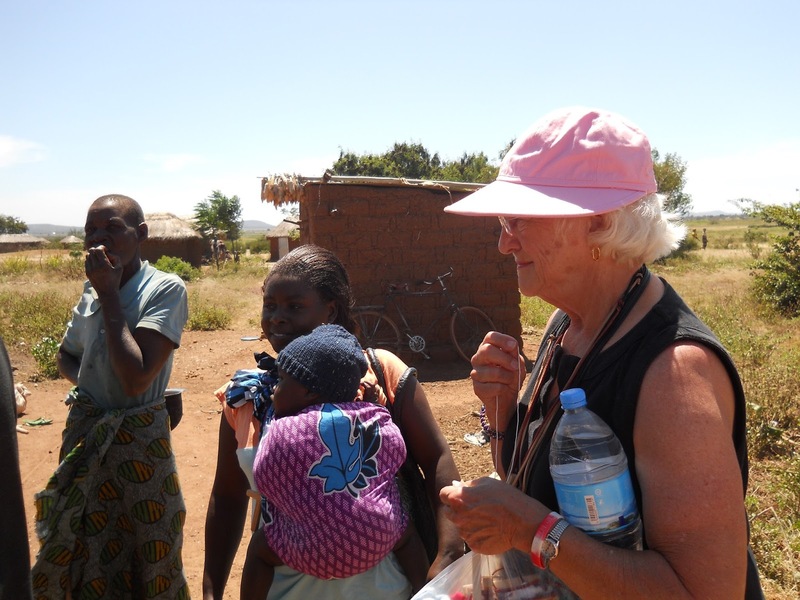 When I turned around and noticed there were gone, I asked the group of children trailing behind me….where’s the mazungu(white person)? They pointed to the trees and I followed as they led the way through the brush, down a path and to a small hut. I arrived in time to witness the baptism of our new sister in Christ. This was a perfect end to a good day. If we traveled from America for this old lady, it would have been worth it. I am reminded of the story of the woman who loses a coin. “Suppose a woman has ten coins and loses one. Doesn’t she light a lamp, sweep the house, and look for the coin carefully until she finds it? This coin was not lost.